Come to Golden: Ride the river, see the vistas, and have a blast. Yes, it's worth the drive! Golden is located between the Canadian Rocky Mountains and Columbia Mountain ranges and with close proximity to six of the most stunning national parks that Canada has to offer; Banff, Glacier, Jasper, Kootenay, Mount Revelstoke and Yoho, Golden BC. Golden sits at the confluence of the Kicking Horse River, a Canadian heritage river famous for whitewater rafting, and the Columbia River, a BC heritage river which meanders through the longest protected wetlands in North America. First settled in 1882 as a single building called “The Cache”, Historic Golden has been a center for mountain adventure for over 130 years. Golden was an early home of the Alpine Club of Canada from the Swiss Village just outside of town. Golden is home to Kicking Horse Mountain Resort, where you can experience some of the best skiing in North America and during the summer months downhill biking and the grizzly bear refuge are both open. We have an award winning golf course, extensive down and cross country mountain biking terrain, some of the best whitewater rafting in the world, vast snowmobiling terrain for sledders of all abilities. With a varied selection of accommodation plus winter activities and summer activities, includingfamily friendly activities, the friendly mountain town of Golden continues to be a perfect holiday destination from which to enjoy and explore the Canadian Rocky Mountains. Every summer, tens of thousands of people raft the Kicking Horse River. Alpine Rafting operates in Golden, British Columbia, 30 minutes west of the Alberta/British Columbia Border. We are a short drive from Banff, Lake Louise, Invernmere, Radium, and Revelstoke! Our office is conveniently located on the Trans Canada highway next to the Golden Rim Hotel. We have safe, ample parking to accommodate oversized vehicles. Below are directions on getting here. Head west out of Calgary on the Trans Canada Highway (HWY 1). Stay on the Highway for 2.5- Hours. When you get to Golden we’re the very first exit at the top of the Golden Hill. Follow the signs to the BC Visitor Info Centre and take the first exit. Make sure you pack a comfortable saddle and blanket. Take Alberta 2 South to Calgary. Exit and Stoney Trail and get on the Trans Canada Highway heading west for 2.5 hours. Alpine Rafting is the very first exit on the right when you arrive at Golden. Total trip time from Edmonton is about 6 hours. You can take a Greyhound bus from Edmonton AB, to Golden, BC, all year ’round. 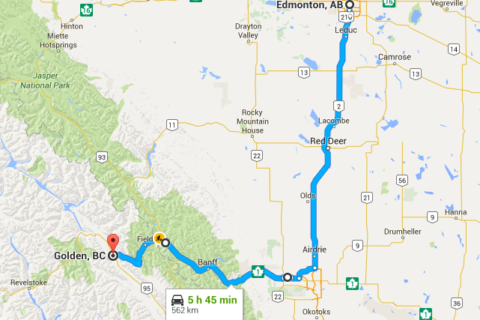 The trip takes about 9 hours one-way and departs from Edmonton four times daily. Cost for a return ticket averages about $230 pre-tax. Well, first you need to find yourself a wizard… Golden, BC has an airstrip suitable for landing small planes and helicopters, for when the Giant Eagles are roosting. 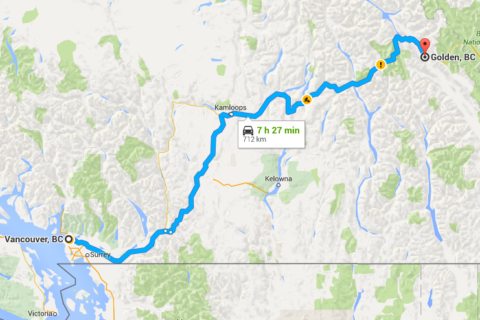 Head East out of Vancouver on the Trans-Canada Highway, stay on it Eastward to Kamloops. 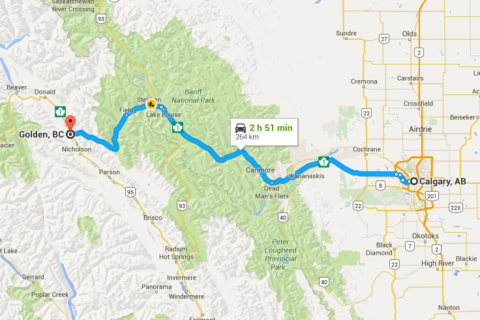 From Kamloops you’ll head East to Golden on BC-1 E/BC-95 S. The trip by car takes about 7.5 hours total. The tip by Bus, one way, takes about 10 hours from Vancouver. It leaves Vancouver 4 times daily, and return costs about $300 before taxes. It’s the same as coming from Vancouver, only half as far and half as expensive.